KABUL, Afghanistan — The number of Afghan civilians killed in war-related violence rose 15 percent in the first half of this year, according to a U.N. report released Thursday that offered grim statistics about the human toll of increased fighting. Violence has been on the rise as the Taliban and other insurgents try to regain territory lost in the fall and winter to the U.S.-led coalition in southern Afghanistan. Fighting always picks up in the spring after the opium poppy crop is harvested in the south and the snow melts elsewhere in the mountainous country, allowing insurgents to move more freely. But suicide attacks and other bombings have intensified as militants try to undermine confidence in the Afghan government’s ability to provide security as the U.S. begins to withdraw some forces. In a midyear report, the U.N. said 1,462 Afghan civilians lost their lives in the crossfire of the battle between Taliban insurgents and Afghan, U.S. and NATO forces. During the first half of last year, 1,271 Afghan civilians were killed. May was the deadliest month for Afghan civilians since the United Nations started tracking deaths in 2007, with 368 killed. The number of civilians injured rose too _ by 7 percent. In the first six months of the year, 2,144 civilians were injured compared with 1,997 during the same time last year. “They are caught in the middle _ caught between two sides and have little places of refuge and little protection,” Georgette Gagnon, director of human rights at the United Nations Assistance Mission in Afghanistan, told reporters. She read an account from a resident of Marjah, a district in Helmand province, a dangerous region in the south that has seen a heavy share of the fighting. “The Taliban come to any house they please by force,” the man told the U.N. He said Taliban fighters fire from civilian homes, then the U.S.-led coalition and Afghan security forces return fire. The U.N. report attributed 80 percent of the civilian deaths to insurgents and others fighting against the Afghan government _ up from 75 percent in the first six months of the year. International troops and other pro-government forces were to blame for 14 percent of the deaths; 6 percent were not attributed to any party to the conflict. 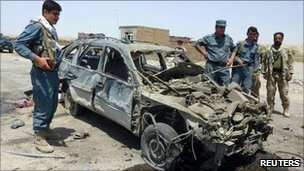 Suicide attacks and roadside bombs, also called improvised explosive devices or IEDs, together accounted for 49 percent of all civilian deaths, the report said. Civilian deaths from IEDs rose 17 percent from the same period in 2010, making them the single-largest killer of civilians in the first half of this year. The U.N. report said militants had stepped up their use of bombs, particularly ones that explode when someone steps on them or a vehicle drives over their pressure plates. “These devices are produced in many parts of the world and they can also be handmade,” said Staffan de Mistura, the top U.N. official in Afghanistan.